Internet Explorer password recovery software reveals lost or forgotten passwords of web based e-mail accounts if you use the associated programs of these accounts. 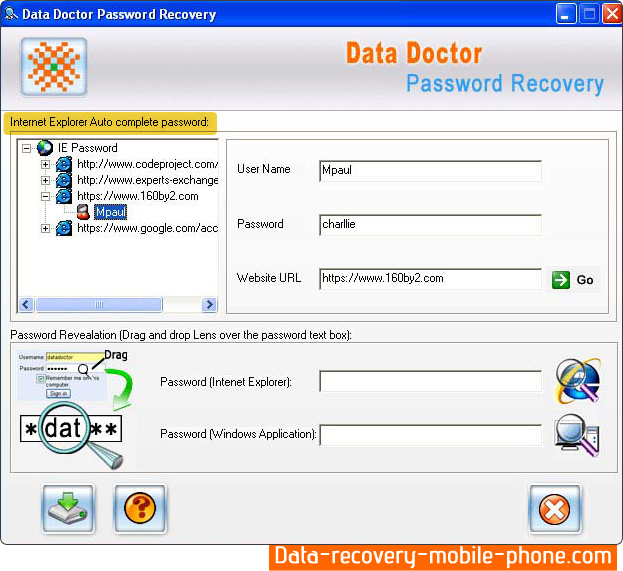 Password recovery software provides facility to manage and restore lost internet explorer saved password including e-mail, news group, online shopping, magazine subscription, chat account, web forms or any windows application saved passwords and much more. Password unmask tool uncovers password behind the asterisks and protects important password ever entered on your computer PC. IE password restoring utility is capable to recover all types of IE saved password including identities password, IE Auto Form and AutoComplete fields, FTP passwords and AutoComplete passwords. Password finder tool helps to restore password for both (Admin and Administrator) and facilitates to save recovered password list to user specified area for further reference. Recover all lost and forgotten password of password-protected windows application accounts. Restore all types of IE saved password including FTP password, IE auto form and auto complete password. Facilitate to save identity password for both Admin and Administration users. Unmask hidden password behind the asterisks in Microsoft Internet Explorer.